Staff Sgt. 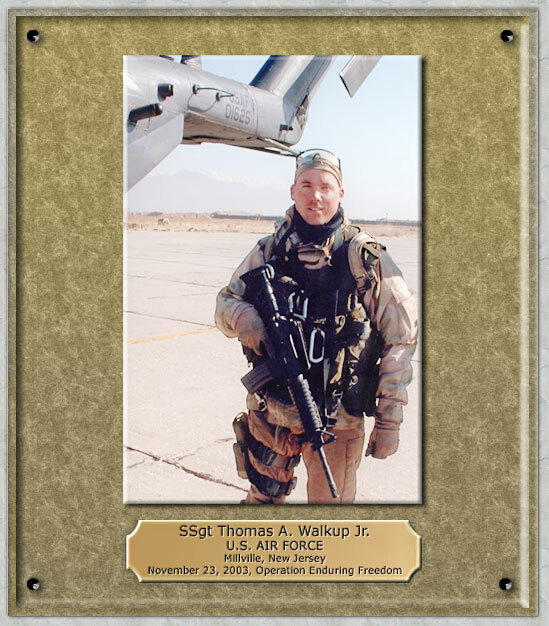 Thomas A. Walkup Jr. Hometown: Millville, New Jersey, U.S.
Died: November 23, 2003 in Operation Enduring Freedom. Unit: Air Force 20th Special Operations Squadron, Hurlburt Field, FL. Air Force Staff Sgt Walkup was assigned to the 20th Special Operations Squadron, Hurlburt Field, Florida, as a flight engineer. The 20th Special Operations Squadron typically conducts low-level penetration operations into enemy territory, providing air support for ground troops and resupplying Special Forces units. Walkup was onboard an MH-53 Pave Low helicopter conducting combat operations for 'Operation Mountain Resolve' when it crashed nine miles east of Bagram Air Base. A compressor problem caused one of the two engines on the Pave Low to stall, leaving it with one engine operating and too much weight to carry in the thin mountain air. The pilots attempted to jettison the auxiliary tanks without success and then the other engine stalled while an emergency landing was being attempted. With all power lost, the helicopter fell from an altitude of about 200 feet onto an uneven river bank, rolled over and burst into flames. Eight people somehow managed to survive. 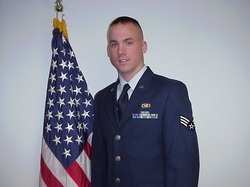 Thomas enlisted in the Air Force at 18, soon after graduating in 1996 from Millville High School where he played on the junior varsity baseball team. At his funeral service, mementos and photos of Thomas were on display. Flanking the opposite side of his coffin were his flight helmet, camouflage gear and volunteer firefighter badge carefully arranged. Bearing the prestigious Purple Heart and Medal of Honor, his newly pressed military uniform hung along one side of his flag-draped coffin. Photographs on display showed the many faces of Thomas – one with him grinning with a rubber glove on his head, vacationing with his wife in Mexico, and sporting a Happy New Year hat and merrily blowing on a party favor. He also loved to go camping and was a volunteer firefighter with the Holley-Navarre Fire Dept in Florida. Everyone remembered how much fun he was and that he was usually smiling. Kayla Murphy, 14, whom Thomas occasionally baby-sat said, "He was the fun baby-sitter." She recalled one time when he accidentally locked them outside her home and he had to break his way back in thru the kitchen window. But there was also another side of Thomas, the military side. He was the stoic professional who took very seriously what he did. In a recent email sent to his family he said, "I will fly with two American flags in my tactical bag, one for each of you. I will continue to fly these flags with me through all I encounter, then hopefully one day I'll get the chance to give them to you personally." He is survived by his wife, Staff Sergeant Carissa Walkup. Thomas' second funeral was on January 21, 2004. An honor guard preceded a horse-drawn caisson containing a single flag-draped coffin with the remains of the five servicemen killed in the crash; Air Force Maj Steven Plumhoff, Air Force Staff Sgt Walkup, Air Force Tech Sgt Howard Walters, Sgt Phillip Albert, and Air Force Tech Sgt William Kerwood. Because their remains were commingled, the five received a single burial. All five names appear on a single tombstone. Tom was born April 6, 1978 in Elkins Park PA (just outside Philadelphia). In 1990, Tom was 12 when his family moved to Millville. He attended Rieck Ave. School, Memorial Jr. High, and graduated from Millville Senior High School in 1996. He was an Alter Server at St. John Bosco Church and worked at the High Street Acme from the age of 16 until he enlisted in the U.S. Air Force at age 18. 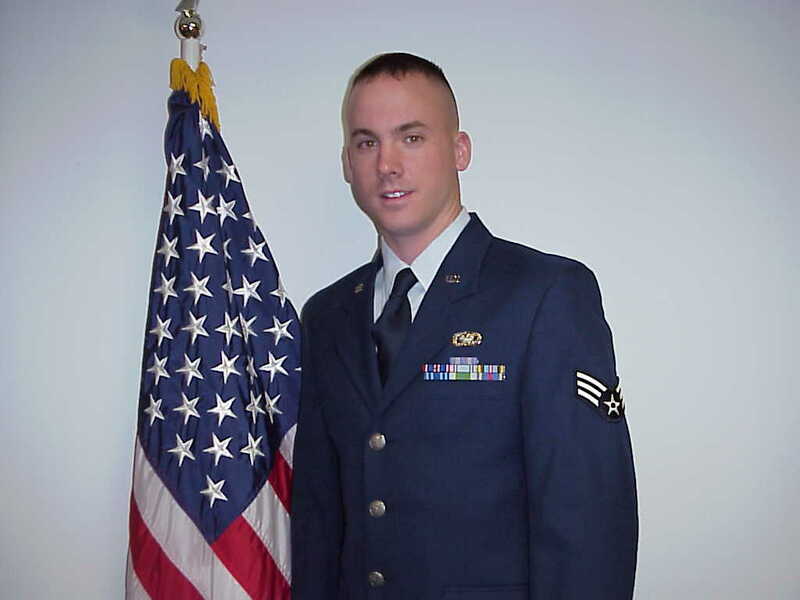 Tom entered active duty with the Air Force on September 4, 1996. After basic training he was assigned to the 56th Transportation Squadron, 56th Fighter Wing, Luke Air Force Base, Phoenix, Arizona. He served as a material control specialist and also was a member of the base honor guard for over three years. During his time at Luke AFB he volunteered with the American Red Cross, Ronald McDonald House, Air Force Aid Society, West Side Food Bank, and the Phoenix Fire Department. On June 1, 2001 he was appointed to the rank of Staff Sergeant. In March 2002, he was assigned to Kirtland Air Force Base in Albuquerque, New Mexico for training as a MH-53 Flight Engineer. 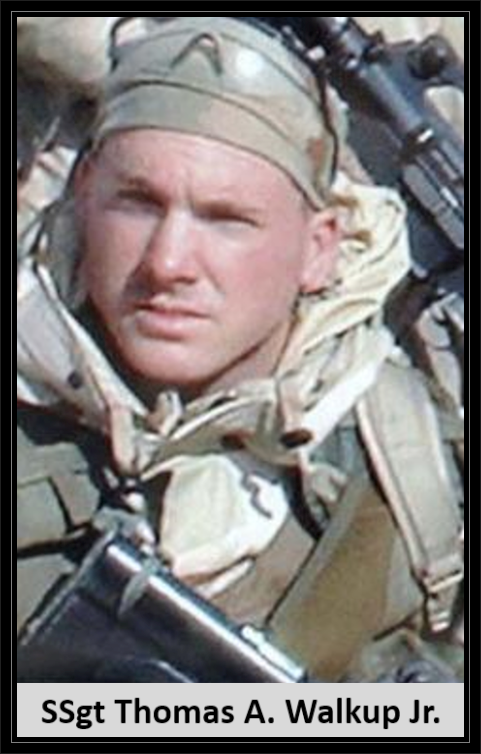 On June 15, 2002 he received the Air Force Commendation Medal. In June 2003, after 15 months of intense training, he was assigned to the 20th Special Operations Squadron, Hurlbert Field, Florida. During his time in Florida he volunteered with the Navarre Fire Department. In September 2003, he was deployed to Africa, then to Afghanistan. 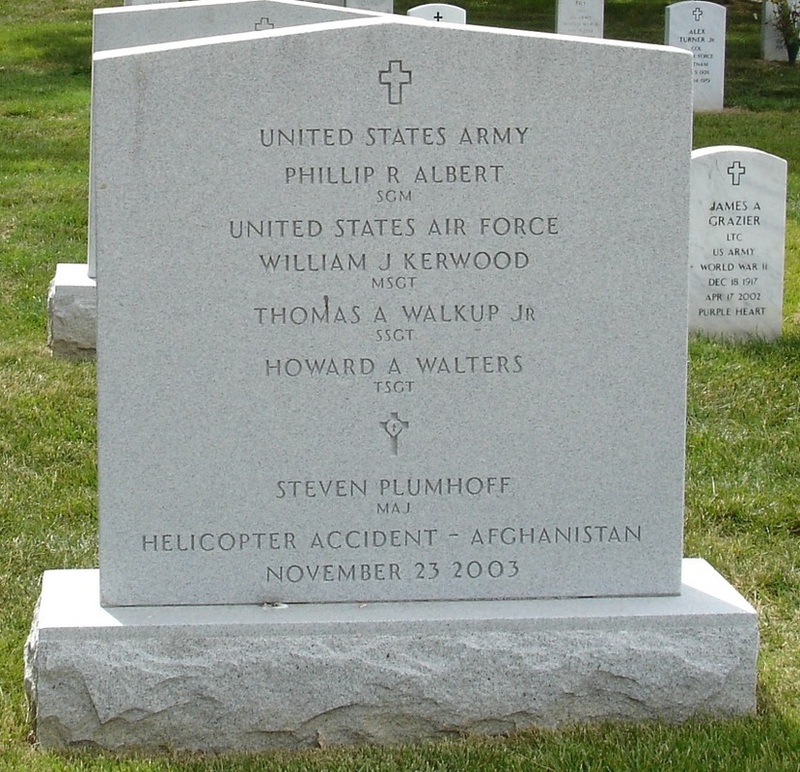 On Sunday, November 23, 2003 as part of Operation Enduring Freedom, his MH-53 Pavelow Helicopter crashed in the mountains after experiencing an engine failure. Tom and three other crewmembers were killed on impact. During his internment services at Arlington National Cemetery on December 30, 2003 he was awarded the Purple Heart and the Meritorious Service Medal for his efforts in saving the lives of nine other persons on the aircraft. Tom is survived by his parents Tom Sr. and Patricia, his sister Susan Justis, and his niece Alyssa Jordan Justis. He will always be remembered for his ability to make people laugh and his willingness to help anybody in need. Tom served his country with pride and gave his life for what he believed in. Bearing the prestigious Purple Heart , his newly pressed military uniform hung along one side of the flag-draped coffin that cradled the fallen airman. Flanking the opposite side of the coffin were Walkup's flight helmet, camouflage gear and volunteer firefighter badge carefully arranged in a fitting tribute to the man who died serving his country.He was 25. She recalled the time Walkup accidentally locked them outside her home and had to break his way back in through the kitchen window. “I still have a dented screen,” joked Kayla's mother, Rosie Murphy, 47.